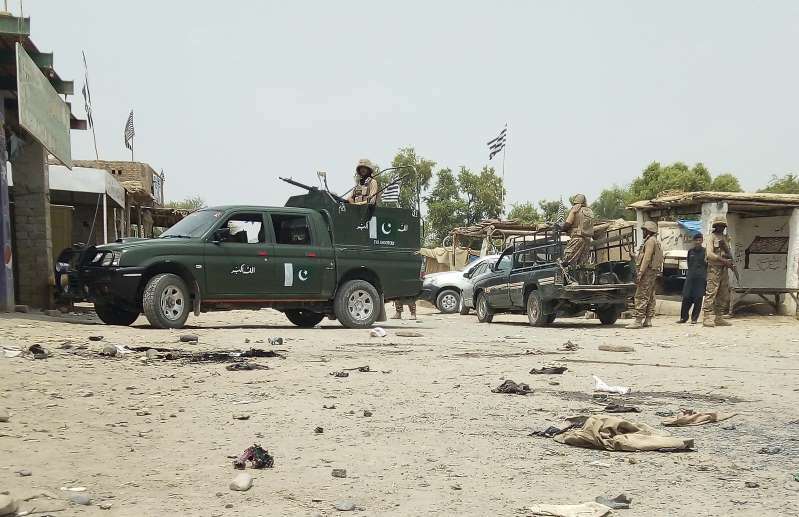 Pakistan army troops guard the area of suicide attack at an election rally in Bannu, Pakistan, Friday, July 13, 2018. A week of bombings on political rallies has shattered the relative peace of Pakistan's general election campaign, culminating in a devastating suicide attack that killed at least 130 people at a rally in the southwestern Baluchistan province. [post_ads]As campaigning intensifies, attacks in different areas of the country have stoked fear of more violence in the Muslim country of 208 million where political rallies can draw tens of thousands of people. The July 25 election features dozens of parties, with two main contenders: ex-cricket hero Imran Khan's Pakistan Tehree-i-Insaf and the Pakistan Muslim League-Nawaz, which vows to win a second term despite the jailing of founder, ex-Prime Minster Nawaz Sharif, on a corruption conviction. Islamic State claimed responsibility for Friday night's suicide bombing at a rally for the Baluchistan Awami Party (BAP). Among the 130 killed was the party's provincial assembly candidate Siraj Raisani. A senior party official said the attack would not dent its election hopes. "It’s a big loss as far as Mr. Raisani is concerned for us ... But will it reverse the course of the political party? No," said Anwar ul Haq Kakar, a BAP member of Pakistan's Senate. Pakistan's campaign until this week had been relatively peaceful, compared with frequent attacks by the Pakistani Taliban during the 2013 election, which saw 170 people killed, according to statistics from the Pakistan Institute for Peace Studies.